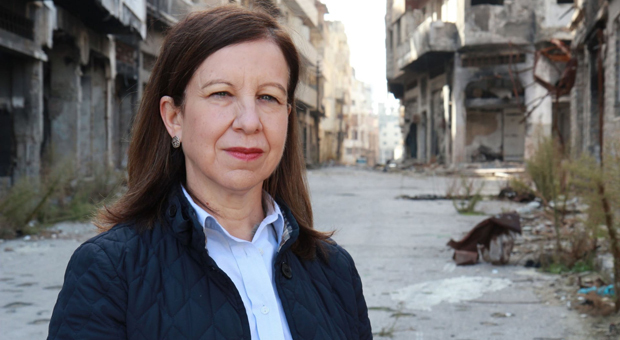 Lyse Doucet, Artsci’80, LLD’15, reporting from Syria for the BBC. Michelle MacLaren, Artsci’86, LLD’16, working behind the scenes. Michelle MacLaren, Artsci’86, LLD’16, directing actors on set of The Walking Dead. The first female president of Princeton University. The Emmy Award-winning producer and director of Breaking Bad. The highest-ranking woman in the Canadian Forces. These are some of the amazing women who have attended Queen’s University and have gone on to impact Canada and the world. In honour of Persons Day on Oct. 18 and Women’s History Month (October), here is look at a few trailblazing Queen’s alumnae. Donna May Kimmaliardjuk is Canada’s first Inuk heart surgeon. The Ottawa-area doctor received an Indspire Award (formerly the National Aboriginal Achievement Award) and has been profiled by various media outlets such as CBC, CTV News, and the Nunatsiaq News. Many people have called her a role model and she is getting used to the title. You might not know her name, but people around the world know her work. 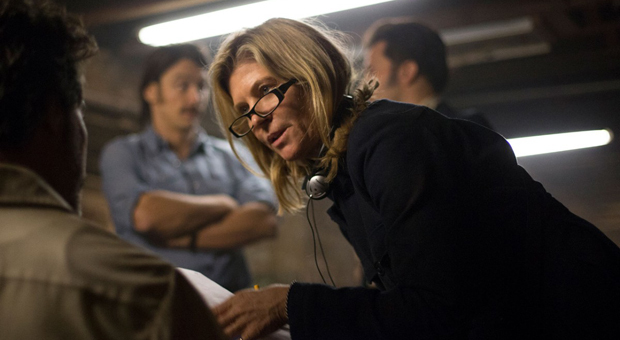 Michelle MacLaren is one of television’s top directors, having worked behind the camera on shows such as Game of Thrones, The X-Files, Better Call Saul, The Walking Dead, Westworld, and Modern Family. She won two Emmy Awards as the executive producer of Breaking Bad, which was named the best TV drama in 2013 and 2014. She was nominated twice in the director category (2010 and 2013). She has signed on to direct her first major Hollywood film – Cowboy Ninja Viking. The movie, based on a popular graphic novel, stars Chris Pratt and is scheduled to hit theatres in 2019. After 30 years away from Queen’s, she returned to campus in 2016 to receive an honorary degree. She told graduates that working hard, having a positive attitude, and making yourself indispensable are key to getting jobs and advancing your career. Visit our Facebook page to watch her speech. The chemical engineering graduate holds the position of lieutenant-general, making her the highest-ranking woman in the Canadian Forces. Her current assignment is as commandant of the NATO Defense College in Rome – the first woman to hold the college’s top job in its 67-year history. During her second year at Queen’s, she saw a military recruitment centre on Princess Street and went inside to enlist. She has now been in the military for more than three decades and has been posted in Afghanistan, Bosnia, and Germany. In 2015, she was given the high-profile assignment of looking at sexual misconduct in the military. Her team had to come up with policies in an attempt to create institutional change and stop harassment and sexual assaults in the military. Broadcast journalist Lyse Doucet might have the biggest audience of any Canadian journalist, but you won’t find her on the CBC. Ms. Doucet is the chief international correspondent for BBC World News television and BBC World Service Radio. She divides her time between anchoring and reporting from the field. Over the years, she has covered wars in the Middle East, the Arab Spring uprising, and the 2004 Boxing Day tsunami in the Indian Ocean. In 2002 in Afghanistan, Ms. Doucet and her BBC crew filmed an assassination attempt as President Hamid Karzai’s convoy was attacked leaving the governor’s mansion. She has won an Edward R. Murrow Award, a Peabody Award, and her reports from Syria helped the BBC win an Emmy Award for outstanding continuing coverage in a regular newscast. Shirley Tilghman was the first female president of Princeton University, a position she held from 2001 to 2013. Before she stepped into her administrative role, she was a renowned molecular biology expert who helped map human DNA as part of the Human Genome Project. She helped clone the first mammalian gene during her postdoctoral studies. Ms. Tilghman is a public speaker who advocates for women in science. She also served on the Google board of directors from 2005 to 2018. She received the Alumni Achievement Award in 2016 – the highest honour bestowed by the Queen’s University Alumni Association – and has credited Queen’s as the place where her love of science bloomed. In 1954, Elizabeth MacCallum became Canada’s first female chargé d’affaires (a diplomat who heads an embassy in the absence of the ambassador) when she was appointed by the Department of External Affairs (now Foreign Affairs) to work in Beirut, Lebanon. The Canadian Press described her as a “world authority on the Middle East,” and she was considered one of the government’s top foreign policy experts. Her work went well beyond Canada’s borders. She was an advisor to the Canadian delegation at the San Francisco Conference in 1945, which drew up the charter to create the United Nations. She returned to the United Nations in 1947, acting as an advisor to Canadian diplomats to discuss the future of Palestine. Elizabeth Smith was a part of the first class of female medical students to graduate, overcoming harassment from professors and male students. She went on to teach at the Women’s Medical College in Kingston. She moved to Ottawa and became one of Canada’s foremost feminist advocates. She was elected the vice president of the National Council of Women and actively campaigned for mothers’ allowances and pensions. Her life was fascinating enough to be the subject of a book. A Woman With Purpose: The Diaries of Elizabeth Smith was published in 1980.